Worried about thinning hair? You don't have to be! 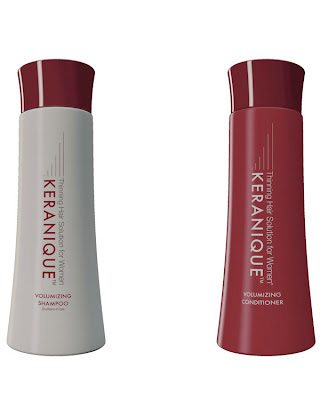 Thanks to Keranique Volumizing Shampoo and Conditioner, that is. This duo is formulated with peppermint oil, which does everything from helping stomach ailments and cold symptoms to enhancing hair and scalp health. And what this means for thinning hair? The peppermint oil moisturizes the hair shaft and stimulates new hair growth while offering up a delightfully tingly effect. Oh, and did I mention this shampoo and conditioner smell fantastic? And here's the best part. Two lucky winners will receive the duo, which has a retail value of $70! To enter, simply leave your name and email address in the box below. Good luck! This giveaway ends on Sunday, May 6 at midnight. One winner will be chosen AT RANDOM on Monday, May 7. One entry per person and email address. Multiple entries will be disqualified. Giveaway is open to US residents only.